The tight buttons on the hummingbird cushion have been bugging me, only very slightly, but enough to make me do something about it. Yesterday I settled down in a chair by the window and started fixing the problem by hand. I had made the holes with the buttonholer, and the easiest way to enlarge them is by hand. My mind drifted back to my school days, and I was grateful for having had an old-fashioned needlework teacher who made sure we learnt the difference between buttonhole stitch and blanket stitch. Do such teachers exist any more? The job isn't half so bad as I had anticipated. All I need to do is extend the buttonhole by three eighths of an inch, giving a massive buttonhole for the replacement buttons that I have bought, big olive-green coat buttons. So far I have finished two buttonholes, so just one more to go. The result isn't super-neat, and I have added to the devil-may-care attitude by using a different colour thread, which will be hidden by the buttons anyway. Now that the fierce summer is over and we seem to be rushing headlong into an early autumn, my husband and I shall be taking a few days off, which includes a sewing and blogging break. So there shall be no more posts until the beginning of September, when I hope to return refreshed and raring to go. 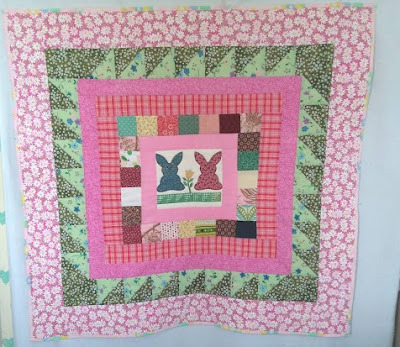 If you have no free motion quilting to show, feel free to link up and show any project you like. Here are the usual rules, but feel free to ignore them. On the settee at last! It seemed to take forever. I thought I was slow starting this project, and it feels as though I have been equally slow finishing. Much as I love the hummingbirds and orchids, the delay in starting was caused by the size of the design. I only had a metre to play around with, and it was difficult to find the right section of it to cut the rectangle I needed so that an interesting part of the design was shown on the front of the cushion. With the large areas of background, I found that it was all too easy to try and get certain elements to the front and then find a large gap would appear in the middle and flowers and birds would drift off to the edge. In the end I managed to settle with three clearly visible birds and two complete orchids, one blue and one green. The quilting was straightforward, outlining the design and leaving the background plain. It was the construction that gave me problems, which was irksome, because after making three other cushions in the past few weeks, it should have been a pushover. I blame the fact that I was getting over yet another bout of hay fever, caused by the harvesting in the fields near our house. My concentration was sorely lacking. To start with, I had forgotten to pre-wash the fabric. Then I put bias binding on the wrong edge. Next I had a real mental block trying to work out how broad the button band should be. 1. Move the buttons - pretty pointless, they are so near the edge I couldn't move them more than an eighth of an inch. 2. Enlarge the buttonholes and sew on larger buttons - why cut the end of a perfectly good buttonhole and give myself some extremely irritating hand stitching? 3. Check the cushion I had stuffed inside wasn't an exceptionally fat one - I swapped the cushion with the one inside the snakeshead cover and managed to reduce the strain on the buttonholes. There is still a bit of a pull, but not nearly so much as there was at first. Despite all the bother along the way, I am pleased with the result, mainly thanks to this little bird, my favourite of them all, who is now hovering in the top left hand corner. Today I thought I would have nice relaxing sit down, propped up by this cushion, and get on with some knitting. Back in January I managed to leave a part-made baby cardigan at my brother's house, and I have only had it back since last month. I decided that today was the day I should carry on from where I left off, so I cast on for a sleeve and made great progress. Once I had knitted a couple of inches I realised I was making the third sleeve. Is it me, or is it the cushion? My one successful crop this year has been lavender. The hot dry weather has meant that the flowers dried quite easily on a sunny windowsill, all spread out on a tray and covered with a cloth. Then came the monumentally tedious job of removing the flowers from the stalks, which can be strong enough to poke through the weave of the material if they end up inside the bag. The brown gingham was all I had left of a small piece of synthetic fabric. It is definitely functional rather than pretty, but the smell is so delightful it more than makes up for the rather everyday fabric. I am already looking forward to next year's crop. You wouldn't believe how much pleasure this sight gave me. After being baked to a frazzle for two and a half months, the sight of rain clouds sent me into a state of near delirium. Our prevailing winds have returned! One of the advantages of an early harvest is that it is much easier to spot deer. This roebuck was in a field of rapeseed stubble, vicious stuff which scratches your legs to shreds. It didn't stop this deer bounding through it, though. Heatwaves and knitting don't usually go together, but somehow I have just kept on going with this project. For a while it was my World Cup therapy, keeping me busy while I was glued to the box and following England's fortunes. While I was knitting the right front England lost their semi-final. Don't ask me what row I was on. Some things are best forgotten. It was all too emotional to watch to watch beyond the 90 minutes. I couldn't bear the pain of extra time because somehow I could tell Croatia were going to beat them, so I went out for a walk and watched the sky from the corner of a field and contemplated God, Man and the Universe, agonising over whether I was all too caught up in bread and circuses. There was a cool breeze, with the scent of chamomile wafting in the air, when I heard loud rustling in the hedge. After standing stock still for a couple of minutes, I saw the grass parting at the side of the path, about ten feet from me, and a baby badger popped his head out and looked straight at me. He gave me a look that said "It's all over", and I gave him a look back saying "I know", at which he strolled off a little way off up the path and then back into the long grass. Suitably refreshed, I returned home, resolved never to forget Trippier's glorious free kick, and set my mind to enjoying the rest of the tournament. If I remember right, I had just finished the ribbing on the left front when France beat Croatia in the final. That was only three weeks ago, but it seems an age away already. Now I have all the pieces on a circular needle and am decreasing for the raglan shaping. It's almost done! Orchids fascinate me. They always look so exotic, with gorgeous variations of colour. In shops I can spend half an hour or more comparing colours, trying to decide which is my favourite. The blue orchids on this fabric look ever so slightly odd, whereas the green ones are more readily believable. 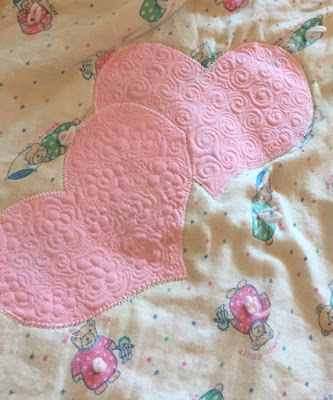 Earlier this week, when making the quilt sandwich, I had an aargh moment. I realised that I hadn't pre-washed the fabric. Too late, I thought. A cushion will need a wash soon enough, and I doubt that it would shrink at 30 degrees on a quick wash. If it does decide to spite me and shrink after all, it will be an excuse to make another. After an afternoon of quilting, I went shopping this evening and succumbed to temptation, which I had been successfully resisting for about three weeks. I bought an orchid. Let's see if, for the first time in my life, I can actually manage not to kill it. Somehow I think the quilted cushion is going to last a lot longer than the real life plant. It's still hot, so whether you are overheating in the northern hemisphere or shivering in the south, if you have no free motion quilting to show, feel free to link up and show any project you like. Here are the usual rules, but feel free to ignore them.